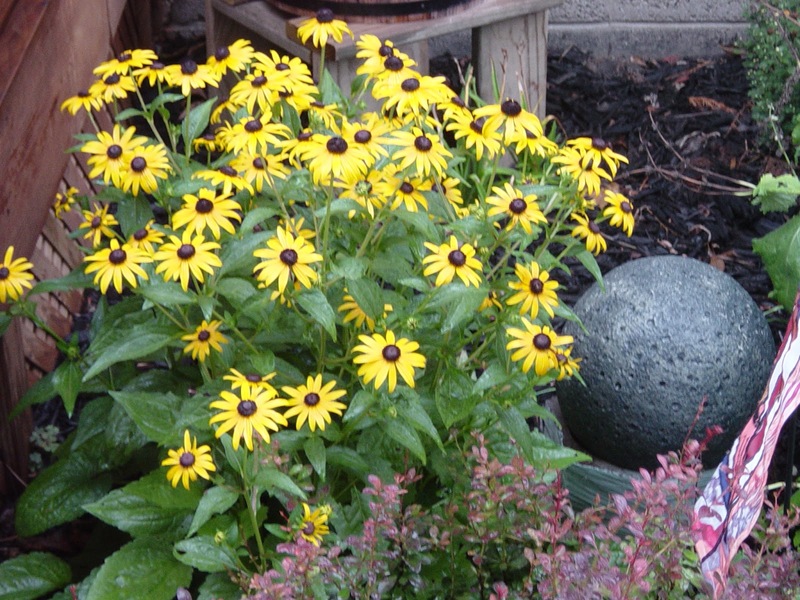 Pictures of some of our mums and black eyed susans. Some are fading quickly. Some just keep getting thicker and thicker. A couple years ago, Emma and I cut out some blackbirds from felt. 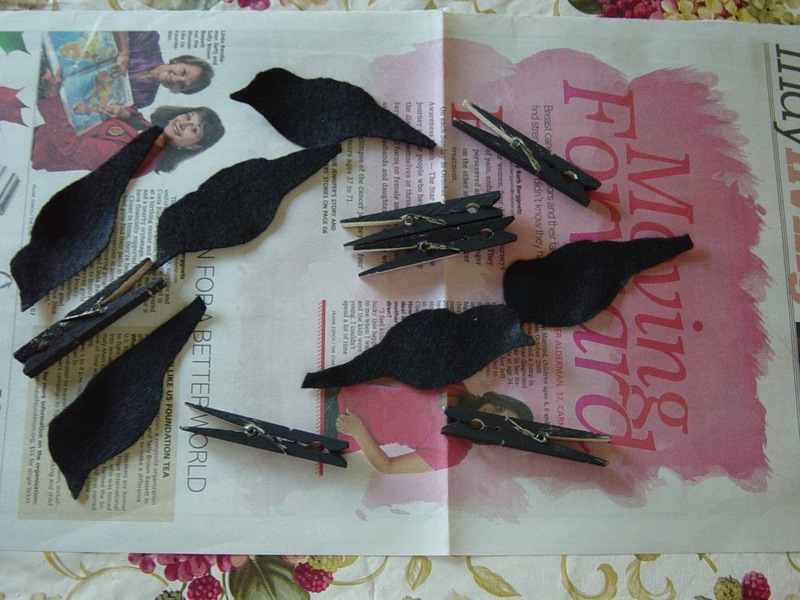 We craft painted some pinch clothespins black also. 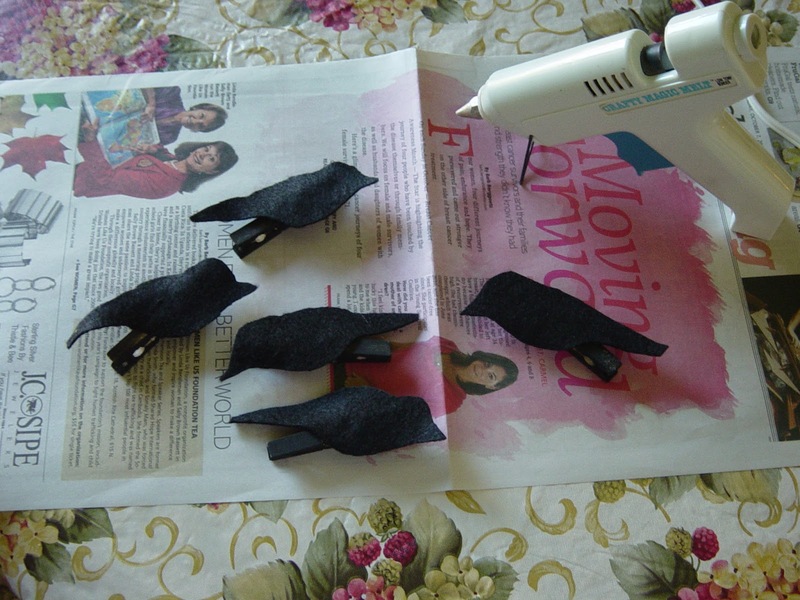 We hot glued the felt birds to the clothespins.. ..then pinned them around the house. I need to look for those pins. It's time to start decorating for fall. 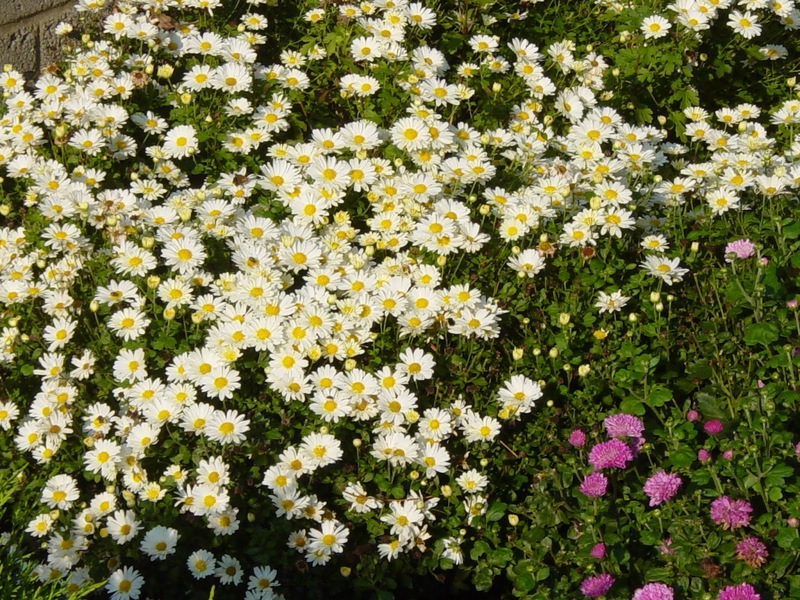 They would look cute pinned to some twigs stuck into your container flowers. Cute and quick kid craft. Today Ted played golf again with his old golf team . He did very well and enjoyed himself. Then when he got home the U.P.S. man had delivered a new truck bed cover. I did not hear the deliveryman , because I was running that industrial shredder...that sounds like a wood chipper. LOL. Yes, yes, another big bag of shredder receipts, mostly hospital and dental records this time. about 4 years worth. LOL. I plan on getting rid of everything but about 2 years worth of records. Once Ted opened his delivery, he wanted to install the bed cover on his truck and asked if I would help him. It certainly wasn't heavy , just awkward for one person. Now it's on the truck and Ted is a happy fellow. Ted and I had a busy weekend. On Sunday, went by Liz's to check on the family. Liz's been watching Max for the weekend. So I got to play with him again. He's a beautiful happy baby. We dropped off my toolbox and troubleshooting cart, for my grandson Skylar. But from the looks of their garage, they do not need more tools. 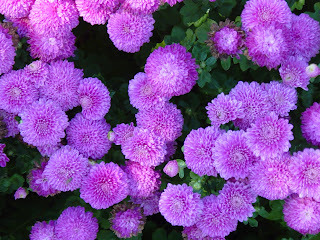 Saturday we checked out the mums at Horton's in Tipton. I do not need any, but wanted to looks at the colors. This has been my friend for the past week or so. It's our shredder. Actually dusty from all the shredding I have been doing. Three bags so fast. I have about another week of shredding ahead of me. Old files, letters and receipts. Found these mug shots...isn't that how they look. LOL It's our old passport photos. I can't believe we actually used these on our first passports. Oh I need to shred these. LOL Too funny. Yesterday we went to Liz 's for a visit. Ted helped Matt split wood and I helped Liz entertain the babies. Here I am holding Max and Layla. These are Liz's grand children, my great grands. Max is almost always smiling and Layla needed a nap. She crawled up on my lap and fell asleep , then I laid her down on the sofa...she slept for about 30-40 minutes. It was so good to be with them. They grow so quickly . I always love to look at this well kept barn. There's this barn and a couple of smaller outbuildings, but no home on this nice property. The sky was pretty again. It did rain in the evening and many floods in Indianapolis neighborhoods last night. Today is End Of Summer Days festival in my daughter's town. We were asked to attend with my daughter Karen's family...but I knew I did not want to walk that much , it's humid and possiblility of rain. Just as I was loving the nicer weather we had the past weekend and at the start of this week, things can change so quickly. In the early afternoon storm and tornado warnings started on the TV.. Oh so thankful to the hard working weather people. I think all the warnings helped save lives. Here's today's Indy Star head lines. With a picture of the Starbucks at the Markland Mall in Kokomo, Indiana. That business was wiped out and twenty people locked inside the restrooms. All safe. We did get in the basement when the reports were that Sharpsville was in line of a tornado. We just live 5 miles from there. There were many tornado warnings and no one killed or seriously hurt. Thank the Lord. Today we will have more chances of storms, hopefully nothing like yesterday. This is our lawn this morning, so green again. The bug man came and did the second treatment of the four we contracted to have. I have not seen any kind of bug in our house since they came and treated for the ants in April. Nothing. The same young man came this time also. He's a good polite person. He said they will come spray the outside on a dry clear day soon.. I think our deck plans may be on hold for a bit. As the mayor of Kokomo asked people to stay away for a while. They only need volunteers to help with clean up. We always shop the Menards and Lowe's stores there in Kokomo for any building material. It's so close (20 miles), less distance on the road with a trailer full of wood. The past three days have been wonderful. Low humidity, white fluffy clouds, the temperatures are not as high either. Ted has weed whacked , trimmed ,and mowed. I have watered plants, swept , and bagged up more donations. We ran here , there and done much more.We have accomplice a lot these last few days. I love it. Now , it begins !! We are building a deck, a small one at the back door. There's a big heavy concrete step there right now. I truly love that man of mine...but dang if he doesn't jump in with both feet at times. First he was going to drill some holes and knock off the corner of this step, to set a post. We wrote down all the measurements and made a list for supplies. So soon there will be a deck back there. We are good at working together. I will get photos of the progress. Today we are waiting for the bug man to do their follow up treatment of the ants we had in April. Isn't waiting for serve people so much fun? Not ! This is the St. Vincent's hospital in northern Indy. Ted and I went to a small birthday gathering at the hospital for his brother Cliff. This is Ted in between his sister Dorothy and his little(taller) brother Mic. Seems Mic torn a tendon in his shoulder. There were cookie for guest. Linda had a cupcake for Cliff to blow out a candle. Which was a bit of therapy for Cliff, it was an effort for him. Linda is a strong woman and I think she will need to me. She told me Cliff's therapy was brushing his teeth and bathing, getting dress. His speech is amazingly good, he searches for words at times. I think his right arm is going to need lots of therapy. This is the lobby at the hospital. Water features and plants and lots of statues . The statues are what I call flying nuns...as I do not know the name of that order of nuns. I think there's 5 of these among the garden area. This is a statue of St Vincent. It's out front. This is a very well landscaped entrance. We stayed about an 1 1/2 , visited with family and church friends of Cliff's. Ted rebuilt the sunflower seed feeder for the birds. I sorted and cleaned kitchen drawers....and actually found the set of keys I had spent a week trying to find. Happy about that. 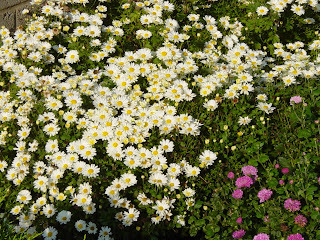 The sedum looks nice and nothing was on it yesterday. Now I wonder why not. Late in the evening , we took a drive around a couple country blocks. This is our shop/garage. It was too cloudy to get sunset photos . I did not get to see the full moon till this morning . It was nice to relax a bit yesterday. Today will be more sorting and hopefully bagging up things to give away. Soon I will be passing my tools over to my grandson , Skylar. That's the set of keys I found. They were for my tool cart and Kennedy toolbox. I plan on doing a post on Labor Day about the career I had before retiring. Yesterday's sunset. I thought it was a red, white, and blue sky. Just breath taking.. It had rained again in the early evening. This is looking east.... softer colors. Then back to the west. The patches of blue showing thru the clouds were just unbelievable. Then to the north. I could have stayed out till dark watching the clouds change . Here the rain is pouring down earlier. Beating my flowers down...what to do ..haul container here and there for water , or not too much rain. Wears me out..so there they sit getting wet and beaten. We got a small shower yesterday afternoon. It did not last long but was appreciated. I rolled up the rug this time, so it would not get wet. Think I'll leave it rolled up for a couple days or so. This is something I did while it was raining. Played with making a new table scape. I used some of a small cow collection I have. Some green and white things. We watched a movie yesterday. Later we cleaned up the hummingbird feeders and filled them. Today we will be cleaning up Ted's truck...I told him it smelled dirty while riding to town yesterday before the rain. I know there were ten thousand dead bugs on the windshield. Look how brown our lawn is becoming. Even the willow tree is losing leaves, from the dryness. The skies are beautiful with billowy white clouds. We had a breeze yesterday (Friday). The flag waved all day. It did seem more like a Santa Ana wind from California. Hot and dry. Today (Saturday) is cloudy and a bit dark....so maybe we will get some rain soon. The lawn needs it .....so I am sure the crops around these parts also need rain. Ted and I have most of our chores done for this week. There's a couple of projects in the near future. We want to build a small porch at the back door. One big enough the keep the wood box at the back door during winter months. Plus we will be working on plans for the greenhouse/shed . We have gathered windows and doors a plenty.